"Sowerby, Lee Time to saddle up, pardner, and hit the trail to action in the Olde West, from the Comanche Wars (1836) to Wounded Knee (1890). 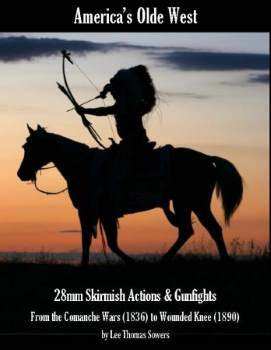 This skirmish rule set, an offshoot of the WWII Skirmish Action rules, certainly covers the traditional Wild West (post ACW to 1880s), but the Indian Wars ranged over a far wider period and so does America's Olde West. Initiative is by faction (gang, squad, war party, posse, etc. ), which usually numbers between four and 10, and each figure gets one action: Move, Shoot, Take Cover, and so on. Then each figure dices against its Quality number for a second action...BUT, certain factions receive a second action without needing a roll to offer subtle differences between factions."